With that toxic environment as a backdrop, Nadella inserted a different word into the company’s lexicon: empathy. One of his first acts after becoming CEO in 2014 was to ask top Microsoft leadership to read Marshall Rosenberg’s Nonviolent Communication: A Language of Life, a treatise on empathetic and compassionate communication and relationships. Better pricing for your product or service doesn’t start with you. To use Peter Drucker’s terminology, it’s not about your product or service, it’s about the customer’s want. Your reason to exist as a business must be to empower customers. 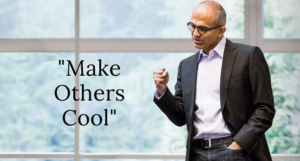 This mindset change has paid tremendous dividends for Microsoft. Annual revenues have grown to over $100 billion, the highest in their history. Microsoft’s lead over Amazon in cloud-based revenue has widened. The company’s share price has tripled since Nadella became CEO. You don’t have the all the resources of a major global corporation to make this simple change in perspective. Size is not a natural advantage here. You can empower your customers no matter how small your business. If you do that, you become essential to them. If you’re essential to your customers, your pricing becomes a whole lot easier.